I saw this children’s book on a magazine rack inside Robinsons Supermarket a few months ago. I found the book cover visually appealing and the subject of the book very interesting. I was actually curious to know how John Gokongwei Jr. became a very rich man. I bought this book for just Php125.00. Why is John Gokongwei Jr. called Big John, you might ask? He has an answer to that. He says he is called Big John for three reasons. First, he is 85 years old and weighs over 200 lbs. Second, he owns a big company that operates many businesses. Third, he is a very rich man who has made a lot of money through the years. However, he said, he wasn’t always “Big John with money.” There was a time in his life when he was “little John with no money at all.” John’s family used to be rich because his father owned a lot of movie theaters in Cebu. His father died, however, when John was only 13 years old, leaving behind a trail of debts. Because John’s family had no money to pay the people his father owed money to, these people took away their house and movie theaters leaving them with nothing but his mother’s jewelries that she had to sold in order to feed her children. Because John was the eldest child, he had to be responsible for his younger siblings. He became an entrepreneur at a young age by first selling cooked peanuts with garlic and then venturing into the buy-and-sell business selling just about anything—onions, oranges, old newspapers and magazines, used clothing, etc.. Later on, John’s family started creating their own products which are now being sold in many parts of the world. Kids and kids at heart will surely learn a lot from John Gokongwei Jr.’s life story as it imparts the value of hard work, patience, perseverance and family. I am now 85 years old. I am no longer little John. I am now Big John who weighs over 200 pounds. I have a good wife and a good family. This children’s book was a gift to John Gokongwei Jr. from his six children (Robina, Lance, Lisa, Faith, Hope and Marcia) on his 85th birthday. Big John was written by Yvette Fernandez and illustrated by Abi Goy. Part of the proceeds from this book will go to the Gokongwei Brothers Foundation which supports Philippine education by donating facilities, granting scholarships and supporting programs in schools. 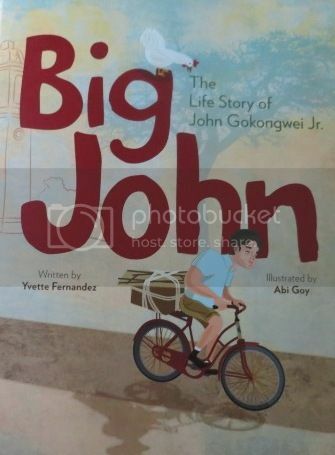 This entry was posted in Big John: The Life Story of John Gokongwei Jr., Children's Book. Bookmark the permalink. I also saw that at the bookstore but decided not to buy it. Now that I’ve read a good review, I think I’ll buy it next time for Ykaie.